There’s a new OSHA compliant Ridgid shop vac available at your favorite Home Depot. Well, it’s not actually new from top to bottom. Ridgid is has a new filter/bag setup that’s going to make some existing models HEPA and OSHA compliant. What’s really compelling here is the price. The least expensive model in our OSHA-compliant dust extractor shootout was over $500 and they went up beyond $800. Adding up the cost of the vacuum and filter/bag kit gives you an OSHA compliant Ridgid shop vac starting under $150. Those are huge savings, especially for smaller crews that don’t have the spending power of major construction firms. Even looking at just the kit price, many HEPA filter replacements for a dust extractor exceed $50 without the pre-separator bags. Here’s the deal: you have to use both the filter and bag in order to maintain compliance. Using one without the other won’t cut it. It’s also specifically designed for use with handheld saws and grinders. The system isn’t going to cover all of Table 1, but it does catch a nice group of applications in its net. Both the VF6000 HEPA filter and VF3602 cyclonic dust bag are required. 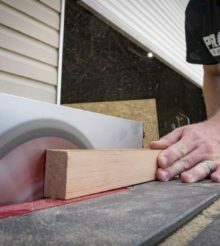 System is Table 1 compliant for handheld power saws cutting fiber cement board, handheld grinders for removing mortar (tuckpointing), and other uses other than mortar removal. Table 1 compliance depends on the vacuum meeting minimum airflow requirement based on the tool manufacturer’s specifications (all compatible vacuums have at least 100 CFM). When using a grinder, you need 25 CFM for every inch of grinder wheel diameter. I thought to be table 1 compliant that it must have auto filter clean? Please correct me if wrong.